Gosh, what happened to October? The fall semester seems to be flying by as quickly as the leaves whipping through the Fine Arts courtyard. But the season isn’t the only thing changing on this side of the Ring. Here’s a quick update of what’s happening inside our own faculty. 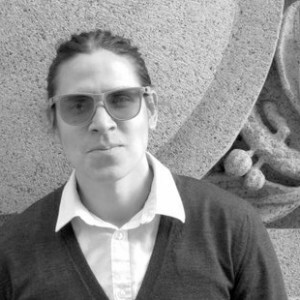 • Nicholas Galanin is this year’s Audain Professor of Contemporary Art Practice of the Pacific Northwest. The Sitka-born Galanin is a multi-disciplinary Tlingit/Aleut artist who has struck an intriguing balance between his origins and exploration in new perceptual territory. 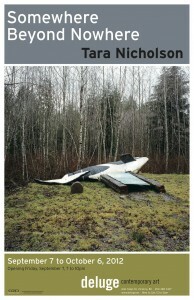 He’ll be teaching here through to the spring 2013 and, like previous Audain Professors Rebecca Belmore and Michael Nicoll Yahgulanaas, will have an exhibit in the Audain Gallery in September 2013. 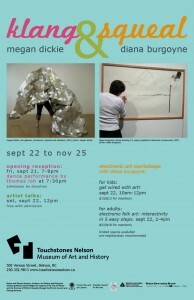 • Winnipeg artist Jennifer Stillwell began her tenure-track position this semester. 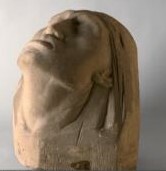 Stillwell’s practice in sculpture, public art and video has brought her considerable attention, as noted in this earlier post. • On the sessional front, Thomas Chisholm returns as sessional instructor this year, as does recent Interdisciplinary PhD grad Jackson 2bears. Chisholm was recently announced as a finalist in the 2012 RBC Canadian Painting Competition, while 2bears picked up his MFA in Visual Arts back in 2004, and is also teaching with Writing professor David Leach as part of the Technology and Society minor. • Longtime painting professors Robert Youds and Sandra Meigs are both back from their academic leave this fall, and Lynda Gammon is going on leave in January. • The Department of Theatre has two new sessional instructors this year: Bronwyn Steinberg in the fall semester and Michael Armstrong in the spring. Armstrong is also an MFA candidate for the Department of Writing. Both will be teaching Theatre’s Public Speaking course. • Also new in Theatre is Catherine Plant, who has been hired as the new Audience and Client Services Liaison person. Be sure to say hello to her when you catch the Phoenix’s upcoming production of The Good Person of Setzuan, running November 8 to 24. • Associate professor Susan Lewis Hammond is currently the acting director of the School of Music through to the end of December 2012. 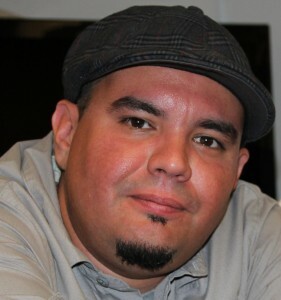 Hammond joined Music back in 2001, received tenure in 2007 and has long been active in the interdisciplinary Medieval Studies program, University Senate and as library representative for the School of Music. • Sessional instructor Gary Froese has stepped up this year as the director of the UVic Chamber Singers. • Trumpet professor Louis Ranger is on study leave this fall, and is currently being replaced by sessional instructor David Michaux. • Noted Canadian playwright Kevin Kerr is the newest permanent addition to the Writing faculty and, no big surprise, he’ll be focusing on drama. Kerr studied theatre at UBC and Langara College’s Studio 58 in Vancouver, was was playwright-in-residence for the University of Alberta’s Drama Department, and is a founding member and artistic associate of the famed Electric Company Theatre, with which he has co-written several plays including Brilliant! : The Blinding Enlightenment of Nikola Tesla, Dona Flor and Her Two Husbands, Skydive and Tear the Curtain. 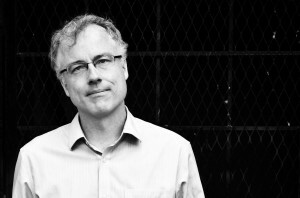 Kerr also received the 2002 Governor General’s Award for playwriting for his acclaimed piece, Unity (1918). • It’s a busy time for study leave in the History in Art hallways, with Allan Antliff, Anthony Welch and Victoria Wyatt all out for the fall semester. Wyatt is also away in the spring, when Erin Campbell will be on leave as well. • As a result, continuing sessionals for the 2012-2013 academic year include 18th century visual art and culture specialist Dennine Dudley and author and frequent Malahat Review contributor Mitch Parry. Also rounding out the sessional list for the fall are Asato Ikeda and Laura Marchiori, with spring teaching duties going to Lesley Jessop and current PhD candidates Melissa Berry and Susan Hawkins. 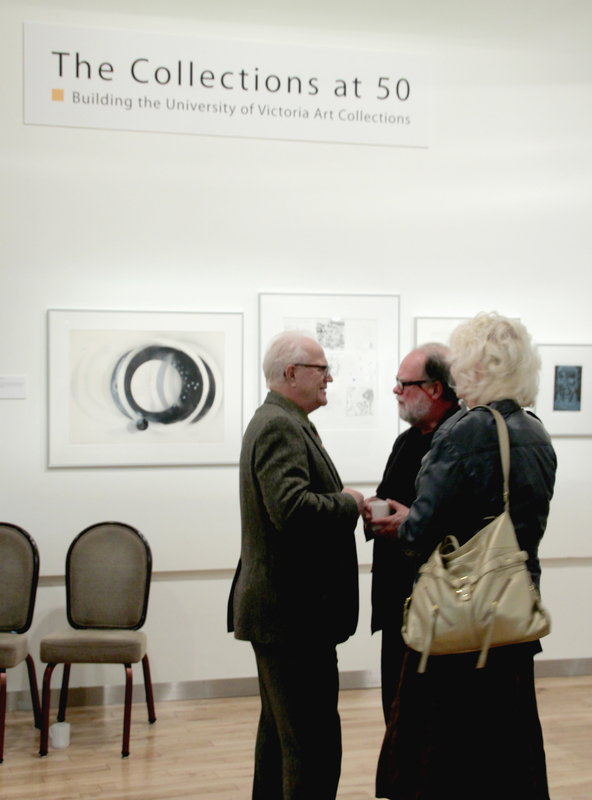 One notable aspect of UVic’s 50th Anniversary celebrations that’s getting some attention this month is the University Art Collection. With the exhibit The Collections at 50: Building the University of Victoria Art Collections running through to November 24 at the downtown Legacy Art Gallery, guest curator, former Maltwood Art Gallery director and retired History in Art professor Martin Segger hosted an illustrated talk on Wednesday, October 17 at the Legacy. With approximately 27,000 pieces collected over more than 50 years, Collections at 50 includes a spectacular array of artwork and artifacts—from First Nations masks by Henry Hunt to works by Emily Carr, William Morris, Lawren Harris and Eric Metcalfe—to trace the development of the collection in tandem with the development of academic programs and research interests at the university. Collections at 50 runs to November 24 at Legacy, and the gallery is open Wednesday through Saturday, 10 am to 4 pm. 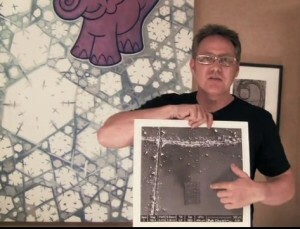 In other History in Art news, professor Allan Antliff has been invited to London, England for some speaking engagements. 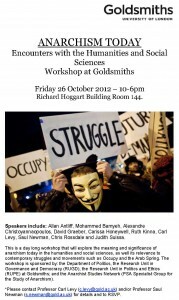 He’ll be at the University of London’s Goldsmiths College on October 26 as part of an “Anarchism Today” workshop, alongside the likes of Mohammed Bamyeh, Alexandre Christoyannaopoulos, David Graeber, Carissa Honeywell, Ruth Kinna, Carl Levy, Saul Newman, Chris Rossdale and Judith Suissa. 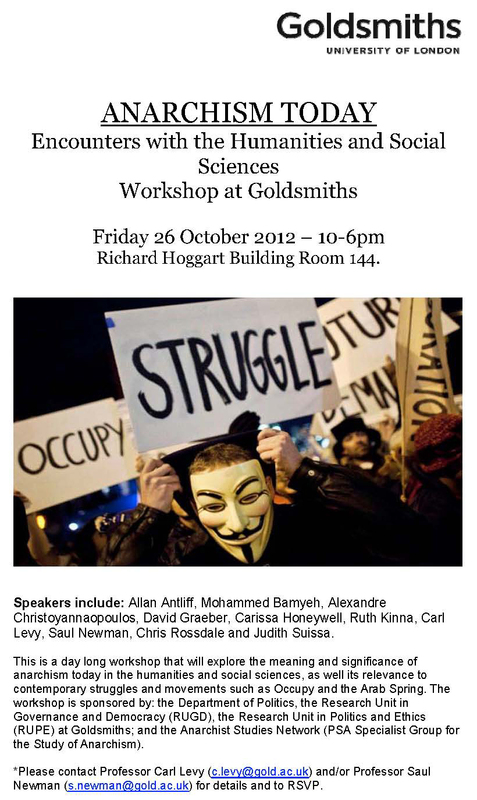 The day-long workshop will explore the meaning and significance of anarchism today in the humanities and social sciences, as well its relevance to contemporary struggles and movements such as Occupy and the Arab Spring. While on the far side of the Atlantic, Antliff will also be speaking to the Anarchism Research Group at Loughborough University, near Leeds, on October 31. The topic of that seminar is “Pacifist-Anarchism and the Arts”, and he’ll be joined by Kenneth Patchen, Jackson MacLow, John Cage and Donald Judd. 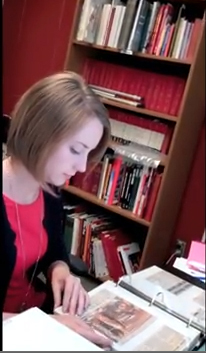 Meanwhile, in student news, History in Art Co-op student Emerald Johnstone-Bedell entered this video of her experience working at the Firefighters Museum of Calgary in the annual Co-operative Education and Career Services video contest. It’s an interesting look at how you can find history in art in just about any topic. 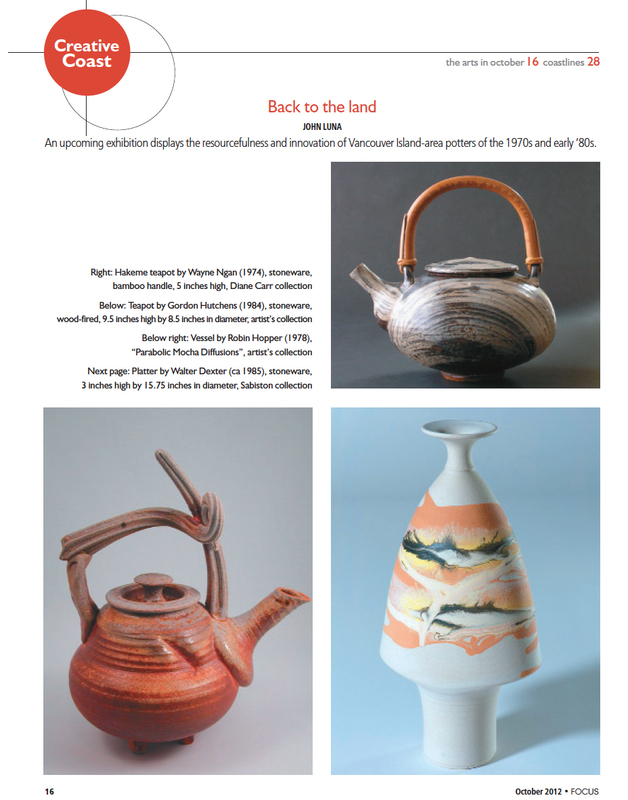 Finally, History in Art alumna Dianne Carr made the news recently in her role as guest curator at the Art Gallery of Greater Victoria’s exhibit Back to the Land: Ceramics from Vancouver Island and the Gulf Islands. Both the local Times Colonist and Focus Magazine wrote articles about Carr, who once owned the local studio The Potter’s Wheel and was the founding director of Vancouver’s Cartwright Street Gallery which became the Canadian Craft Museum. Back to the Land features works by 31 artists who created ceramics between 1970 and 1985. 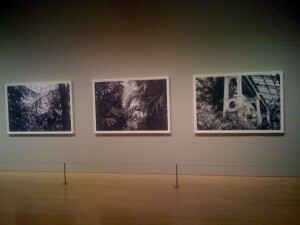 The exhibit runs through to February 3, 2013. Visual Arts photography professor Vikky Alexander took the idea of “mall art” to new heights recently with her pieces in Toronto’s entry in the global Nuit Blanche contemporary art event. Alexander had three enormous 30 by 30-foot photographs from her Crystal Palace 2011 series hung in the atrium of Toronto’s Eaton Centre as part of this free, all-night event that occurred in more than 20 cities around the world this year. Her photos were just one part of T-dot’s seventh annual happening, which featured 150 projects spread throughout the downtown core. 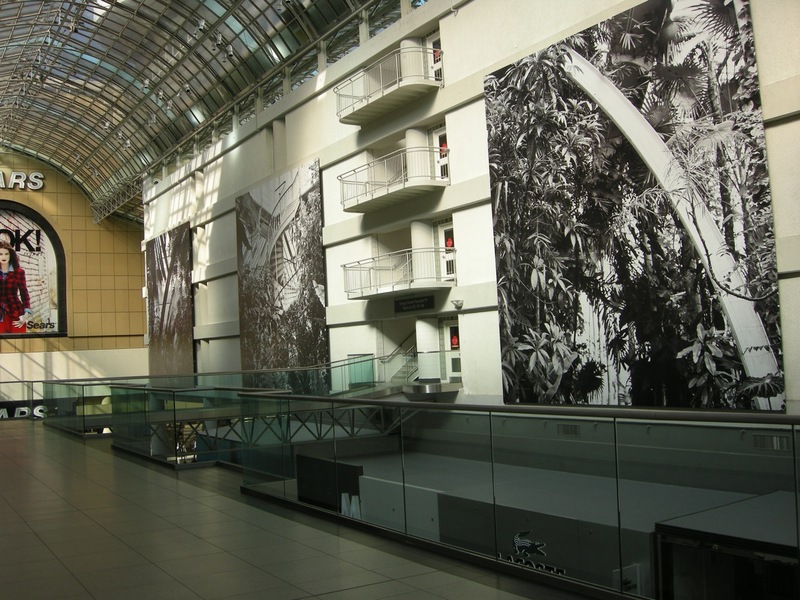 As the Nuit Blanche description makes clear, “the glass and iron structure of the Toronto Eaton Centre atrium echoes the framework of the Palm House in [Alexander’s] photographs. Placing the images in the mural-sized spots reserved for advertising brings a sudden reversal of function to the mall, suggesting its imminent reclamation by aggressively verdant nature.” Not that this is Alexander’s first foray into mall culture. 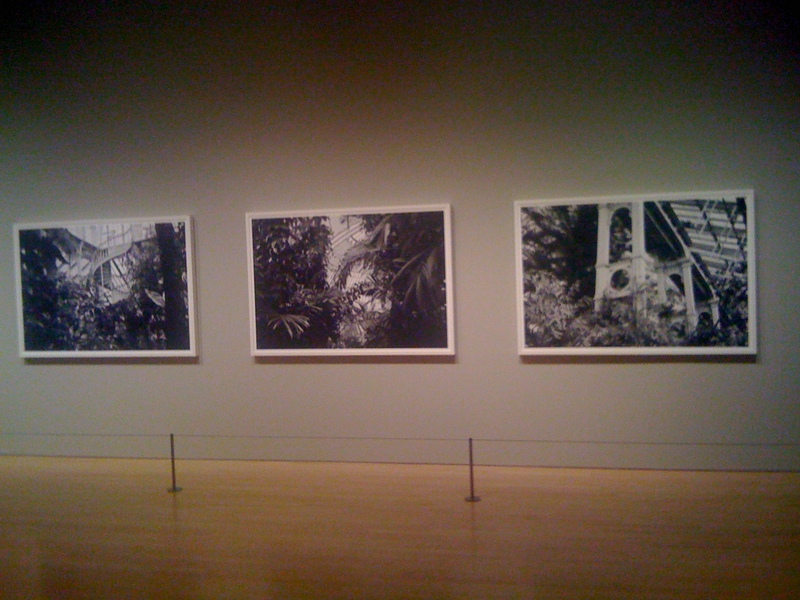 “These new photographs relate directly to the West Edmonton Mall series I made in 1992 where the tropical plants, birds and fish are juxtaposed and contained within the utopian consumerist structure of the North American mall,” she says. In other Visual Arts news, assistant professor of video and drawing Jennifer Stillwell is one of 13 artists in the Winnipeg Now exhibit, showcasing contemporary Winnipeg artists. 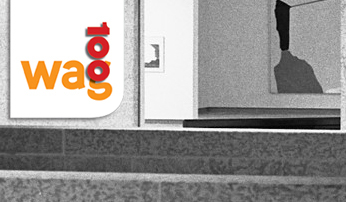 Part of the city’s official centennial celebrations, all of the featured artists either live or have lived in the ’Peg, and the opening coincided with the Winnipeg Art Gallery‘s participation in Nuit Blanche. Stillwell picked up her BFA honours from the University of Manitoba in 1995 before moving on to a MFA with distinction for The School of the Art Institute of Chicago, and has since exhibited widely. 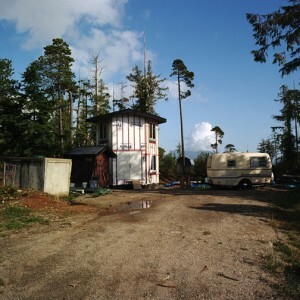 She was also a semi-finalists for the prestigious Sobey Art Award in 2006 (which was won in 2011 by UVic Visual Arts alum Christian Giroux and his artistic partner Daniel Young). 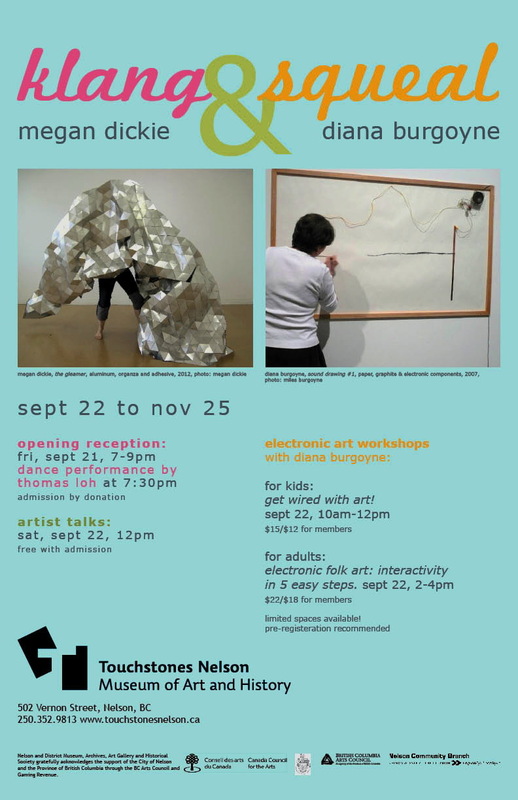 Winnipeg Now continues at the Winnipeg Art Gallery through to December 30. Another member of the Visual Arts faculty with a current gallery exhibit is busy sessional instructor Megan Dickie, whose Klang & Squeal with fellow artist Diana Burgoyne is on now at Touchstones Nelson: Museum of Art and History. 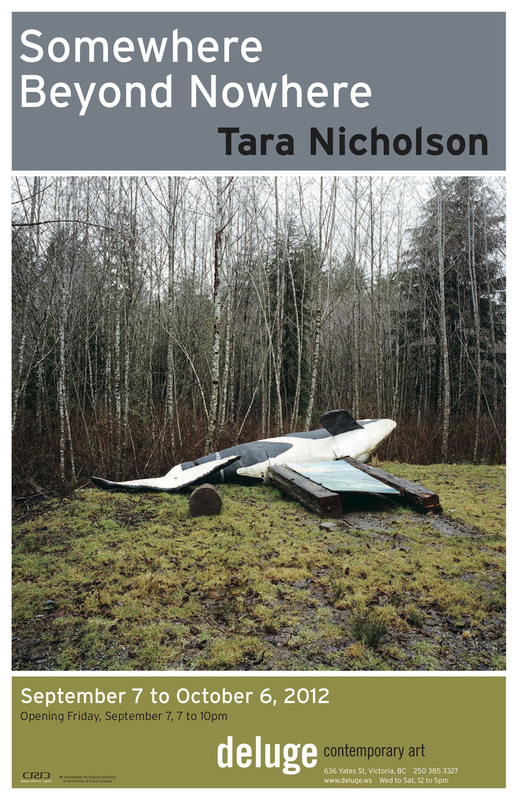 Meanwhile, Visual Arts sessional instructor Tara Nicholson just wrapped up her month-long photography exhibit Somewhere Beyond Nowhere at Deluge Contemporary Art here in Victoria. In Visual Arts alumni news, Vancouver-based artist Robert Chaplin has been recognized by the Guinness Book of World Records for creating the smallest reproduction of a printed book. 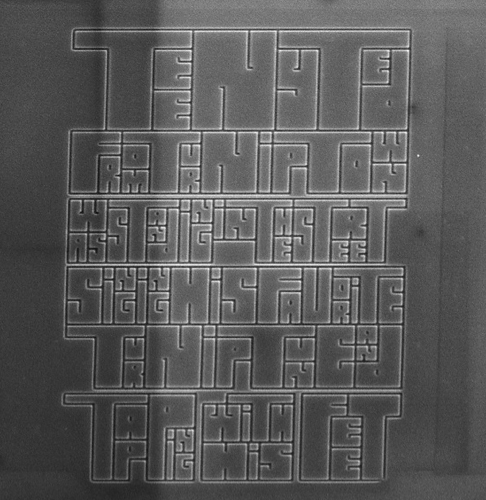 As reported in the Vancouver Sun, Chaplin’s children’s book Teeny Ted from Turnip Town was “etched onto crystal-line silicon using a focused ion beam with the training and equipment of Simon Fraser University scientists in 2007.” But the 1990 Visual Arts graduate only found out this year that he had been honoured by Guinness. 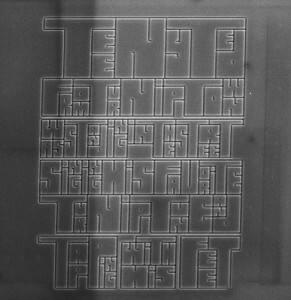 Chapin’s $20,000 one-of-a-kind “nanobook” measures 0.07 mm by 0.1 mm and is made of 30 linked micro-tablets—but no matter how good your vision is, you’ll need an electron microscope to read it. And in order to make a more generally accessible print version of Teeny Ted, Chaplin launched a Kickstarter campaign to create a “large print” version and successfully raised the $17,000 needed to produce it. Talk about thinking big with a small project! 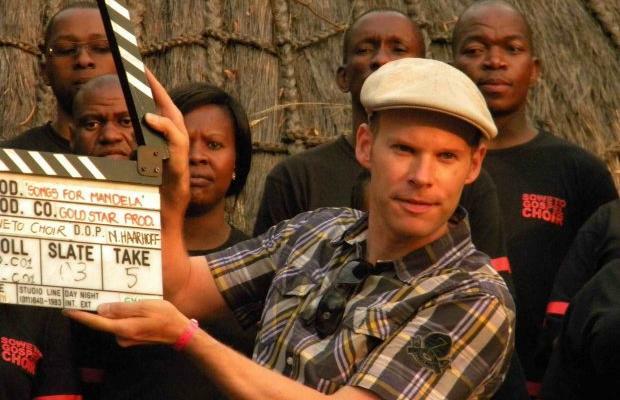 Finally, the Times Colonist reports that Visual Arts major turned Leo Award-winning filmmaker Jason Bourque will be back in town shooting a sci-fi disaster flick called Stonados. Bourque, who earned his BFA back in 1995, will even be shooting on campus for this movie about Boston coming “under siege by a devastating weather anomaly,” as he puts it. (Yep, as the title implies, it’s all about giant stone-throwing tornadoes.) Stonados will eventually air on SyFy Channel. • Monday Oct 15: The Orion Series in Fine Arts presents cornetto player Bruce Dickey. Considered most like the human voice in sound, the cornetto was the most important instrument in Western Music until after 1600. For much of its history, great emphasis was put on supple expressiveness and stunning virtuosity. 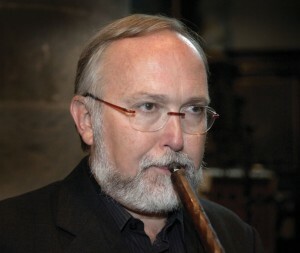 Bruce Dickey, the primary contemporary authority on cornetto repertoire and its authentic performance, will present a lecture-performance about this unusual and nearly forgotten instrument: That Lascivious Cornetto: A practical and historical introduction to a forgotten instrument. 8pm Monday Oct 15 in the Phillip T. Young Recital Hall, MacLaurin B-Wing (free). • Wednesday Oct 17: What’s better than one acclaimed author launching a new book? How about two? That’s the case when University of Victoria Department of Writing Chair Bill Gaston and Writing alumna Marjorie Celona join forces to launch their new books: Gaston’s The World and Celona’s Y. 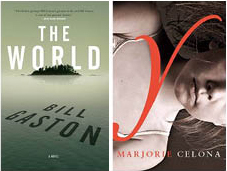 While The World is Gaston’s seventh novel, Y is Celona’s first—yet the Victoria-based Y managed to earn Celona a place on this year’s Giller Prize longlist. A rising talent in the Canadian literary scene, Celona is on the opposite end of the publishing spectrum from the veteran author, poet and short-story writer Gaston—who has been nominated for the Giller himself, as well as the Governor General’s Literary Award, among many others. Both novels are published by Penguin Canada’s imprint, Hamish Hamilton. This event runs from 6pm Wednesday at The Bard and Banker Pub, 1022 Government Street. Free. • Wednesday Oct 17: Join former Maltwood Art Museum director and Gallery curator Martin Segger for an overview of the history of the University’s art collection over the past 50 years. Light refreshments will be served, and an exhibition catalogue will be available for purchase. If you haven’t been to the Legacy lately, this is a great opportunity to see the space and put it into context with UVic’s ongoing history of art both on and off campus. This event runs 5 to 7 pm at downtown’s Legacy Gallery. Please call 250-721-6562 for further information. • Friday Oct 19: After being awarded the position of scholar-in-residence at the prestigious Shangri La Centre for Islamic Arts and Cultures earlier this year, History in Art professor and director of the Medieval Studies program Marcus Milwright spent his time studying the collection’s Syrian artifacts, amassed by Shangri La founder Doris Duke. Now, he’s presenting “Doris Duke and the Crafts of Syria and Egypt” as part of the 50th Anniversary Deans’ Lecture Series. Milwright, director of UVic’s Medieval Studies Program, will talk about the collection of Islamic art and architectural fittings purchased by Duke and assembled in Shangri La, the residence she commissioned in Honolulu. This event runs 12:30-1:45pm Friday afternoon at the Central Branch of the Greater Victoria Public Library, and is free and open to the public, but registration required at the GVPL. 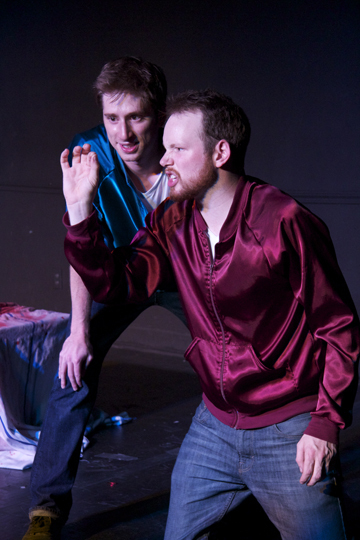 • To Oct 20: Comedy duo Chris Wilson and Peter Carlone are in this year’s Spotlight on Alumni with Peter n’ Chris in The Mystery of the Hungry Heart Motel at the Phoenix Theatre. Based on whodunit detective stories like the Hardy Boys and horror movies like The Shining, this hysterical spoof places our hilarious heroes in the thick of a series of murders at a seedy roadside motel. But who could the murderer be? Okay, the answer is the motel manager—but that’s not the real mystery. Maybe the mystery is why their mattresses are so dirty? Or what this dynamic duo might learn about themselves when they check in? If they ever check out! More than just funny, this is a clever and imaginative production that showcases the skills of recent graduates. This show runs through to October 20 at the Phoenix. 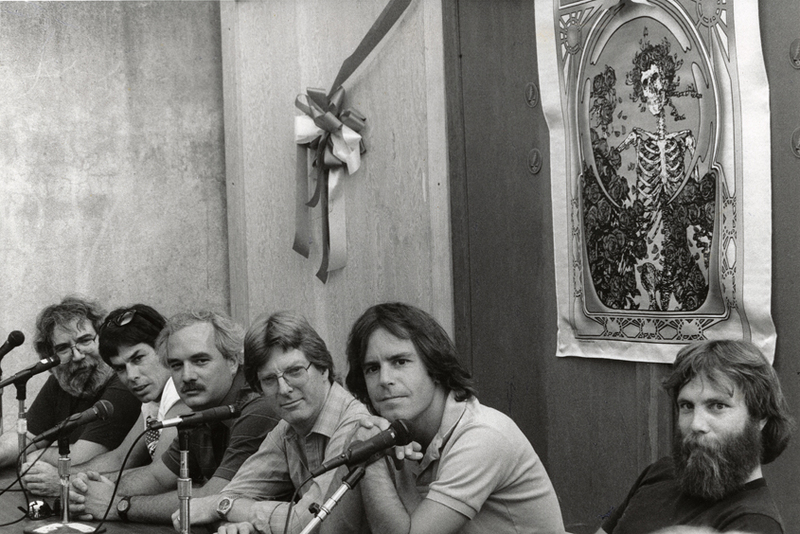 A (dead)heads-up to fans of both archives and the Grateful Dead: University of California Santa Cruz associate librarian Robin Chandler will be giving a public talk about the Grateful Dead Archive Online on Friday, October 12. 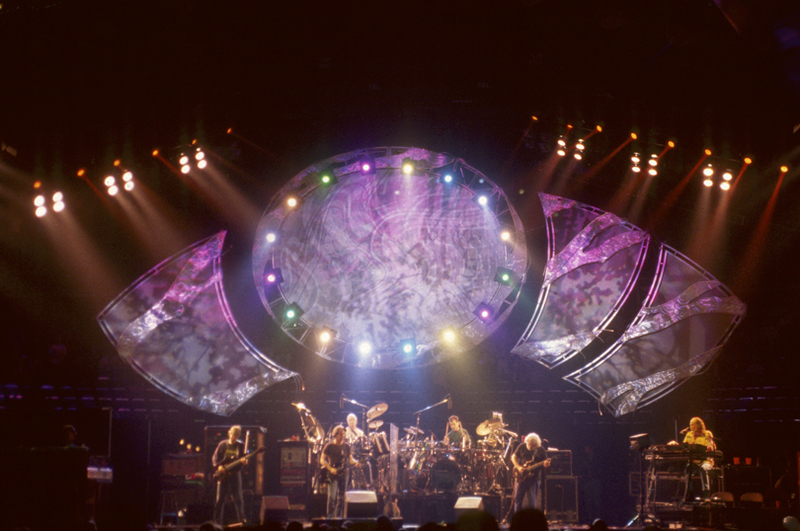 The Grateful Dead Archive documents the iconic American rock band’s 30-year history from 1965-1995, and was donated by Grateful Dead members Mickey Hart and Bob Weir to the UC Santa Cruz in 2008. 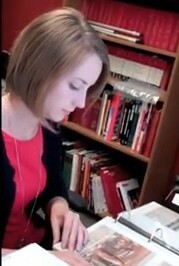 As the project manager for the digitization of the archive, Chandler oversaw the transfer of the materials, as well as the creation of the project’s socially constructed website. Launched in June 2012, the Grateful Dead Archive Online boasts nearly 24,000 items and over 50,000 digital scans of posters, photos and artifacts, including hand-decorated envelopes sent in by fans requesting show tickets. As such, it is one of the most significant popular culture collections of the 20th century. As a bonus, wear any piece of tie-dyed clothing to the event and the five best-dressed will win prizes, courtesy of co-sponsors CFUV and the Greater Victoria Public Library! Catch this free public talk with Robin Chandler from 5:30 to 7:00 p.m. Friday, October 12 at UVic’s Cinecenta in the Student Union Building.